Using this stand is simple and pleasant. Its weight, as soon as delivered, made me have a presentiment of its robustness; the use confirmed it, together with its stability. Which is always the Achilles’ heel of the folding stands. 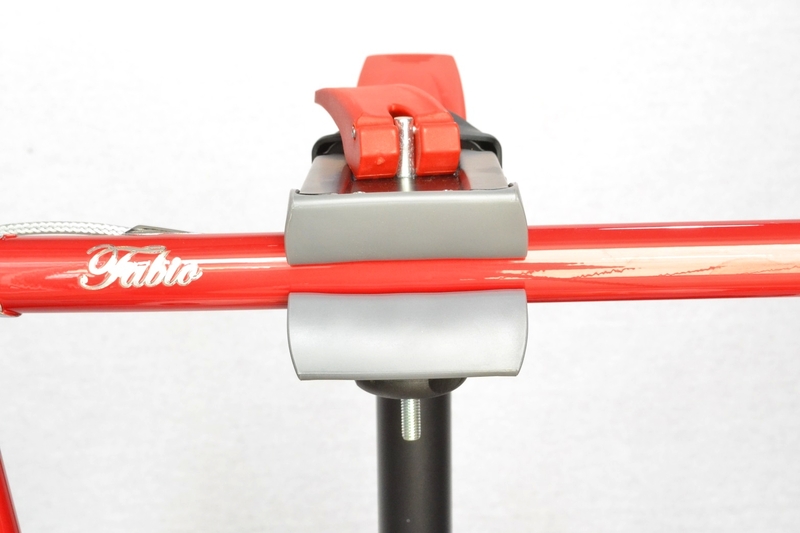 They sway, fall forward, they close up suddenly because the locking system does not have a good grip and many other minor inconveniences that make you regret having traded the convenience in storing it or transporting it with the stability of a fixed stand. 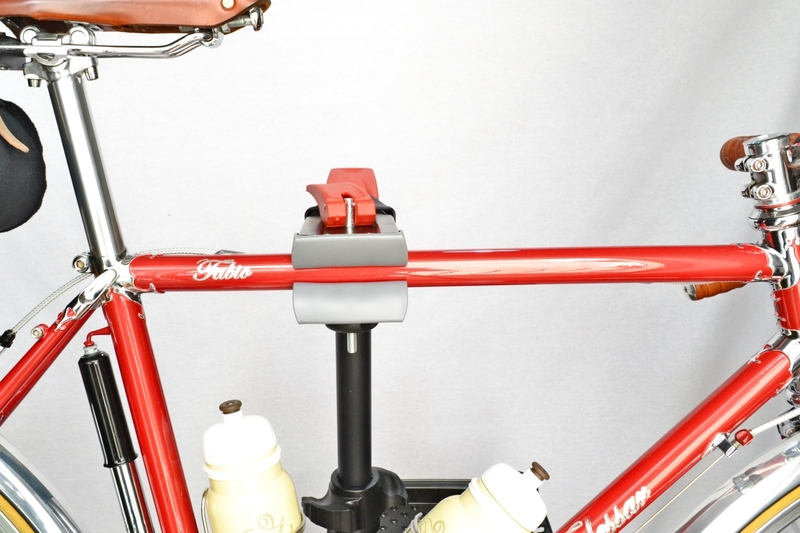 None of this with the Elite Workstand Team I tested. I hooked Ellesar on it, and it’s not light as a feather; I did it using the horizontal, trusting the softness of the rubber pads wrapping the jaws, to avoid to scratch the paint. And, as a good measure, I disassembled the Campagnolo UT middle bracket shells, i.e. the most critical work (the one on the middle bracket) for a vise stand and, moreover, a folding stand. It’s true that I am not somebody who tighten till death, but the caps must be screwed up well. So to unscrew them you need some strength, and you need a stable stand, otherwise you pull the bike on top of you. It did not happen, perfect stability, clean work in a moment. A practical note; one of the advantages of the folding stands, an indirect advantage, let’s call it like this, is that in order to be stable, the must have the tube tilted forward. 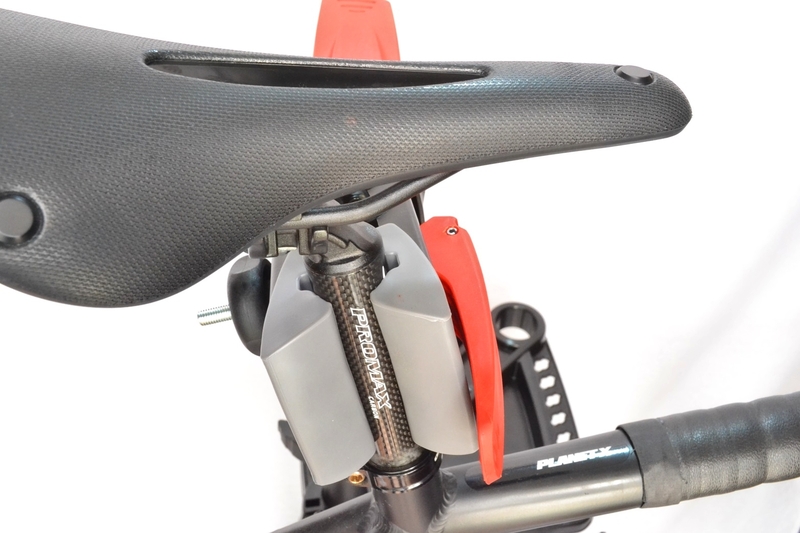 This creates a greater distance between the pedal and the support tube, so, when you turn the pedals, because you are adjusting the transmission for example, they will not bump against the tube. 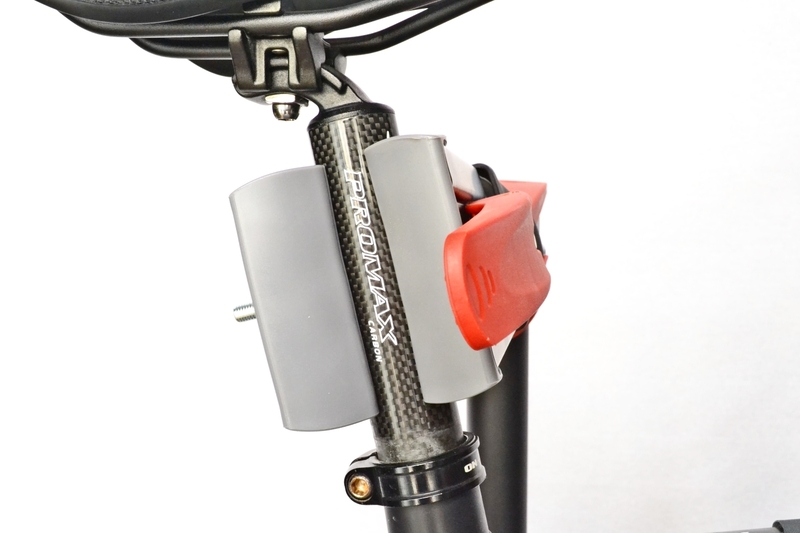 This doesn’t always happen with the fixed stands, but if the bike is fitted with some large freeride pedals, the contact is almost guaranteed. Very uncomfortable. I also hooked up the PlanetX London Road, which in off-road trim weighs less than Ellesar; and why? Because the horizontal is not a regular round tube, but an ovoidal one, crushed underneath and with the addition of a protection added by me: in short, not the easiest shape to tighten. The grip is good and though despite its shape, the outer parts of the jaws ensure the hold. 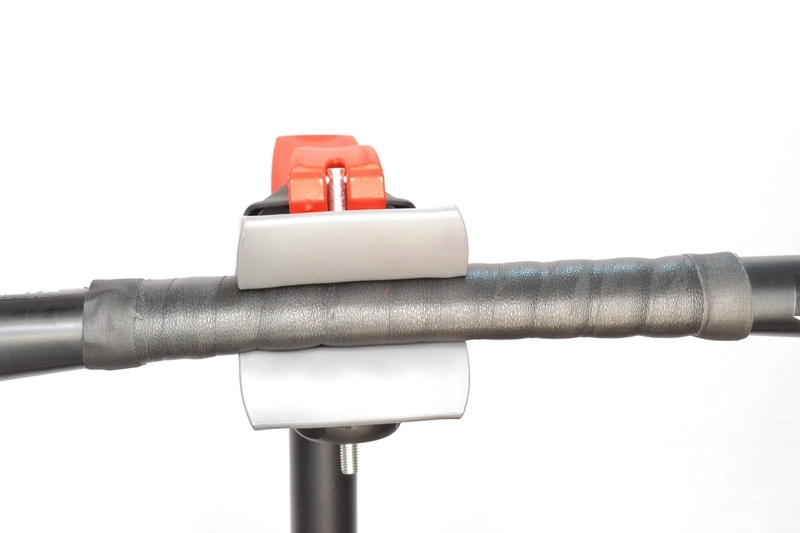 The possibility to rotate the vise allows, obviously, to take advantage of the classic seatpost attachment, preferred by many. Being a round tube, the jaws accurately copy it. 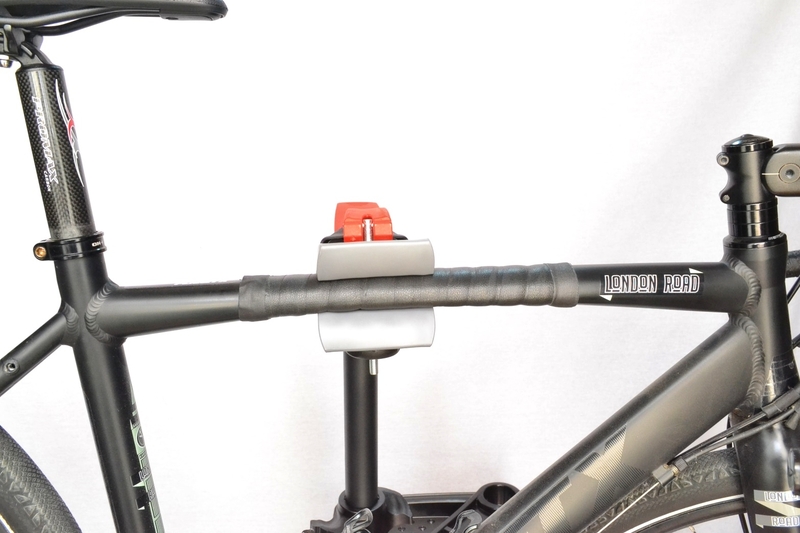 Using the seatpost always imposes a greater grip than the one that would guarantee the same stability if we would prefer to secure the bike to the horizontal. Using a carbon seatpost, I thightened less but the bike did not slip from the firm grip of the jawas. Here again, the testing ground was the dismantling of the bottom movement (BSA Sram Gxp) and this time again everything went smoothly. The handle to adjust the height is easy to handle and does not slip even if our hands are soiled with the grease we are generously spreading everywhere. It is easy to clean this stand, and the handle does not retain dirt; I advise, for precaution, not to use too aggressive degreasers, usually enemies of plastic parts. 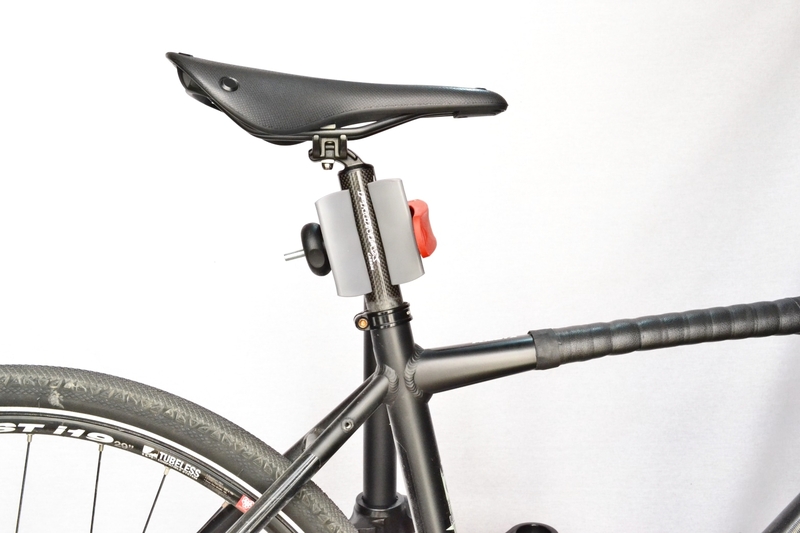 Speaking of plastic; if the Workstand Team is left open, it is preferable to slightly loosen the QR of the lower stopper. I have no data or done tests, mine is a simple deduction: in the long run, the continuous tension could loosen the plastic. I repeat, a simple deduction, a suggestion, let’s say it. The coating, I suppose a powder one, is very resistant. You cannot scratch it easily. Its bulk, when closed, is good for a one-room apartment; it need just a little corner and disappears from your sight. The same if we have to load it in our car. But still without the tray, otherwise is size increases. The only sore point is the lack of any system to prevent the rotation of the steering; considering the high overall quality, it would have been preferable to provide a standard one. 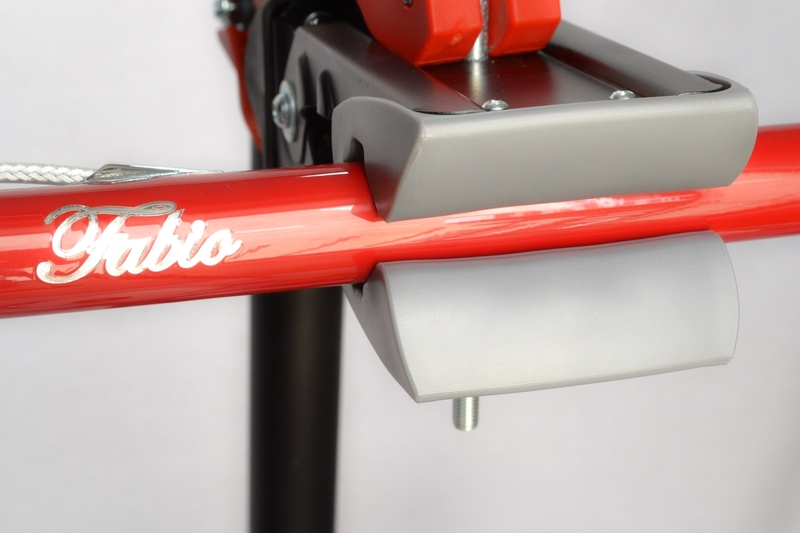 How much the Elite Workstand Team cost? Answering to this question means being able to evaluate it correctly. I don’t know exactly, the price is not in the official website and, when a Company sells also through its website, I use its price and only that price parameter. But Elite offers only parts of its catalog for direct sales, so I resorted to the classic internet search. Where there is a gap, as always. Let’s say that on average you don’t need to pay more than 100 Euros to receive it at home, shipping included where it’s free with a minimum order. Around, I know, you can find some foldable stands that cost less: have they the same quality? Not at all. It is a stand that, in reality, has some performances similar to the professional ones, widely oversized for the needs of us mechanics for pleasure. 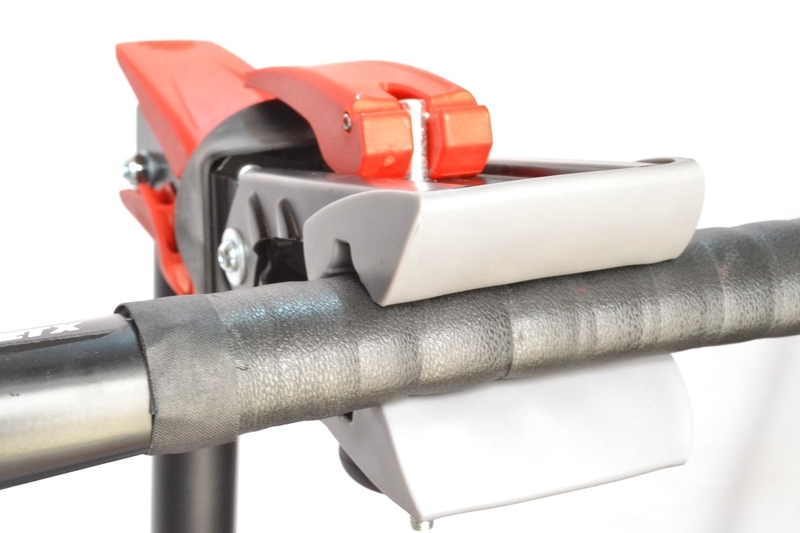 Its perfect stability, its widely adjustable vise, with a soft embrace, even if tough at the same time, the solidity of all its parts, make it a good choice for those aiming for quality. No sacrifices in comparison to the fixed stands. The accompanying instruction manual, simple and clear in its explanations, shows the technical drawing with the numbered list of the parts. There is not a code for every single element but, knowing the Elite’s policy, I am sure it’s possible to get a replacement if something would get damaged, increasing the useful life of the stand. Choosing whether to equip it with a tool tray or not, depends on your personal needs. If the space to store it is very narrow, or you have to hide it under your bed so as you don’t get caught flirting with your bike, it can be actually a problem. If you leave it often open, and the need to close it and store it in tight spaces is occasional, then it is worth to think about it, because it accommodates a lot of stuff. In order and without losing the small parts, thanks to its trays. 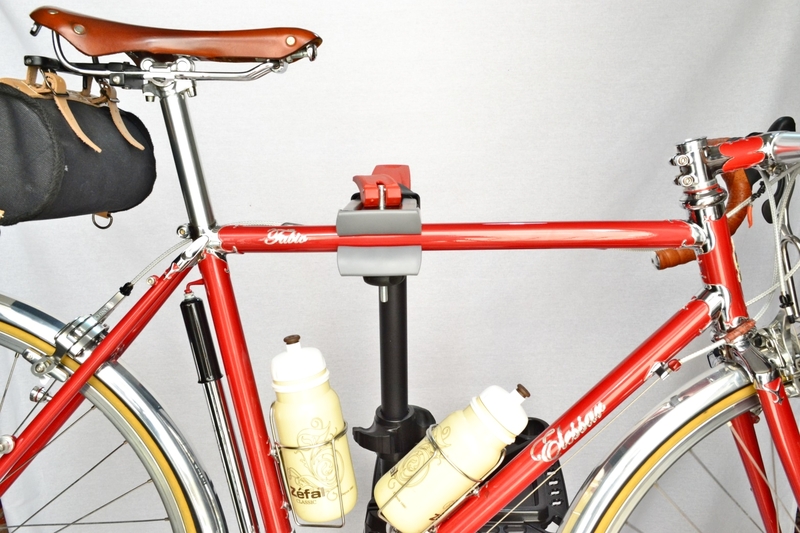 I leave you with the link to the official Elite’s stand website and, as usual, I wish you to have good pedalings.